Home Companies Tan Far Engineering & Development Co.,Ltd. 1.Low power consumption,small space,big capacity for production. 2.Easy to operate and clean. 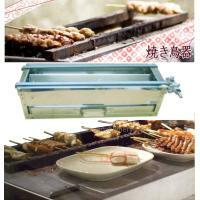 3.Yakitori Barbecue Oven is made of the stainless steel. 4.One control switch, the temperature is can be adjusted by control the gas volume. 5. Indirect heat transfered by the clapboard, producing little ash and smoke.